Important moments in life have been marked throughout the ages with ceremony and tradition. I recently told my just-married son that his wedding day is the one day in his life where more of his friends and family will gather together to celebrate his life-change than any other. We recognize that marriage changes you; you must abandon living for only yourself and put the needs of another above your own. You are no longer a child but a fully engaged member of society who will be expected to contribute to the community. And as parents, we want to see our progeny grow into mature adults. So we celebrate the event with a wedding… a ceremony filled with ritual, symbols, and festivities. It is through celebration and tradition that we mark significance and pass our culture to future generations. Certainly we may write about the importance of certain occasions, but it is only when we vest them with our time and efforts that we most powerfully convey the depth of their magnitude. Think about it. Does a congratulatory card mean more than the presence of a loved one at your wedding? Because purposeful celebration is important, we even mark our national heritage with nationally recognized holidays such as the Fourth of July or Thanksgiving. But no holiday eclipses Christmas. It is simply the single largest celebrated event in humanity, with weeks of preparation and anticipation by Christian adherents and many others. There are vast amounts of time devoted not only to shopping and parties, but to preparing meals and treats ("the way our mothers made them for us"), reflection, attending church services, or traveling thousands of miles to simply be with friends and family. Our media is saturated with songs and movies that supposedly capture the "true spirit of Christmas." 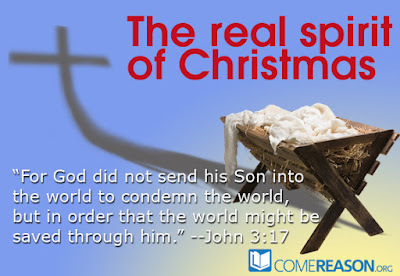 But what is the true spirit of Christmas? Since Christmas holds such a high place in human culture, it is important for us to correctly understand the message these ceremonies and traditions are trying to communicate. Misunderstanding Christmas is easily done. Just this year, the group American Atheists placed a billboard in New York with the images of Santa and Jesus and a caption that read "Keep the Merry! Dump the Myth!" Of course, it wasn't Santa but to Jesus that the myth reference referred. The group issued a press release saying "The true beauty of the season — family, friends, and love — have nothing to do with the gods of yesteryear. Indeed, the season is far more enjoyable without the religious baggage of guilt and judgmentalism." Much of the made for TV holiday fare also boils down the true meaning of Christmas to some similarly amorphous "be-kind-to-others" message. But these obviously do not convey the true spirit of Christmas when you consider how the holiday is celebrated and how it is held in such high regard. The traditions associated with the holiday simply speak to a different meaning. There must be something more, something bigger than a simplistic axiom we all learned in kindergarten. No, Christmas captures so much attention because it celebrates a fundamental change in humanity. The coming of Jesus is a milestone in the history of mankind unlike any other. While Christians would argue (and I would agree) that the death and resurrection of Christ are more central to our salvation, the Incarnation marks a shift in the way God reaches out to His sinful creation. In the fullness of time God sent His Son to be born of a woman so that we could be freed from the curse of sin and adopted into God's own family. Paul doesn't say that such an action was for the Jewish people only, but that God did so for all of humanity. That's why the angels proclaim it as good news for all people, and we reflect that in our traditions. We adopt the German tradition of the Christmas tree, celebrating the life of Jesus among us. We give gifts to one another to recognize the importance they play in our lives mimicking the Magi who gave gifts to the Christ-child to signify His importance. We also deem Christmas significant enough to want to share it with those whom we cherish the most. We understand that it is difficult to spend Christmas apart from them. We know that this celebration unites not just family, but strangers in some way that is different from any other time of the year. Christmas celebrates humanity because it recognizes that God offered the first gift in Jesus Christ, and began the process of reconciling us to Him. There can be peace on earth because the Prince of Peace has come; there can be joy to the world because Jesus, the Joy of Man's desiring is here. And even the fact that the atheists want to keep Christmas demonstrates its power within humanity. We have even marked all of time in reference to His birth. Though the glory of our technical advancements and medical breakthroughs is trumpeted, we can find ourselves poorer than past generations. All the noise and wonder of the modern age can distract us and make us miss the message our traditions bring, offering the poor substitute of "be nice, love one another." Don't miss the message of Christmas this year. The real meaning of Christmas can only be found in Immanuel, God with Us. Jesus has come and He changes who we are and what our position with God can be: those in whom God finds favor. May you and those you love celebrate a very Merry Christmas and may your traditions speak more about the true meaning that Christmas brings.